07.31.12 New York City mayor's new initiative urges hospital nurses to sign out and document every bottle of formula just like a medication. New York City is taking it one step further in addition to joining the list of states and cities looking to ban formula freebies in hospitals in an effort to boost breastfeeding, CBS News reports. The city is putting infant formula in hospitals under lock and key, according to news reports. Starting Sept. 3, New York City Mayor Michael Bloomberg "will implement his voluntary Latch On NYC initiative in which infant formula will be locked away at hospitals to encourage breastfeeding for new mothers," according to the CBS News report. In other words, nurses in 27 of the participating hospitals out of the 40 total in New York City will have to sign out formula just like medications and "document a medical reason for every bottle that a newborn receives," the New York Post reports. Officials insist that the program is voluntary and any new mom who wants to bottle-feed will be allowed to do so. In addition, the "swag bag" of formula samples that are usually given to new moms when they're discharged are disappearing under the new initiative, CBS News reports. 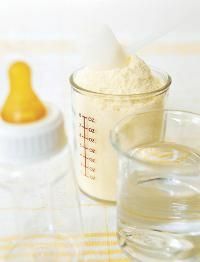 Earlier this month, Massachusetts became the second state to voluntarily eliminate formula freebies from their hospitals, according to the Boston Globe. Rhode Island did the same last year, Crib Notes reported in November. Breastfeeding isn't for everyone, and no one should feel pressured into doing it. Plus, when it comes to breastfeeding success, a little support from people around you can go a long way. Our Ultimate Guide to Breastfeeding offers you almost everything you need to make nursing your new baby a little easier, especially in those crucial first six weeks.